Fine motor skills involve use of the small muscles in the hands. These include skills such as: grasping objects, writing, cutting with scissors, shoe-tying, and fastening buttons. These skills are needed to for self-care and participation in activities at school and at home. Through occupational therapy (OT), patients can develop and improve these skills. Fine motor skills are essential for performing everyday skills like self care tasks (e.g. clothing fastenings, opening lunch boxes, cleaning teeth, using cutlery) and academic skills (e.g. 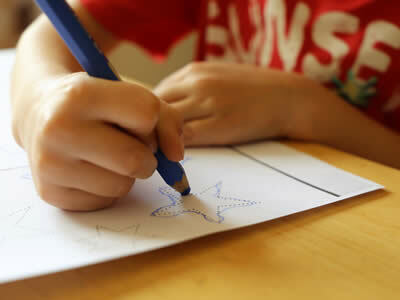 pencil skills of drawing, writing and coloring, as well as cutting and pasting). Without the ability to complete these every day tasks, a child’s self esteem can suffer and their academic performance is compromised. They may also be unable to develop appropriate independence in life skills (such as getting dressed and feeding themselves). These skills are practiced through play, practice and always with a ton of encouragement!